Businesses of all sizes use 'global call forwarding services' to communicate internationally for good reason: it's one of the most cost-effective means of communicating with customers and partners in an increasingly competitive global business world. How do global call forwarding services work? Each country has its own unique calling conventions and country codes. Callers within those countries are familiar with the number layout and audible tones, which also vary by country, and typically don't think twice about dialing numbers that conform to those conventions. When you use our global call forwarding services, you establish a local, in-country phone number for your callers to dial when they need to reach your organization located in any country. From there, you decide where those calls should be routed by assigning a "ring to" number. 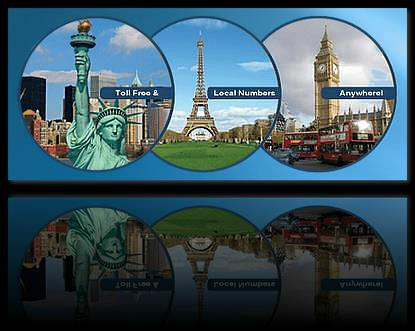 We route the calls to the number you designate which could be located anywhere in the world. The beauty of global call forwarding services is that your callers will see a local phone number and can hear local ring tones just as if they were calling a company located in the same country. This immediately solves a common obstacle that has to do with a caller's concerns about dialing outside their countries. For example, callers could feel concerned about the cost of the call, wonder whether a foreign country can serve their needs adequately, or even have mixed emotions about dealing with an international business. Using a local phone number and global call forwarding services takes these concerns out of the equation. International companies have two main choices when setting up global call forwarding services: local toll phone numbers and international toll free phone numbers. If your organization needs a cost-effective means of communicating with global customers or partners, a virtual number is a logical choice. With a local toll number, the phone numbers are traditional phone numbers with local area codes for a given region inside a country. Callers living within the phone's local calling area are not charged a toll but those living outside the calling area will be billed. The account holder will also be charged a low per minute rate for each call forwarded. With an international toll free phone number, the phone number is a toll free number for the country in which it is issued. Callers will not be charged for the call. Like the local call forwarding numbers, the account holder will be charged a low per minute fee for each call. How can global call forwarding services save money? While businesses do pay for using global call forwarding services, rates are extremely competitive despite the international nature of the service. Moreover, global call forwarding services allow businesses to serve customers in countries around the world without necessarily having to travel to the country, rent office space, or staff an overseas office. In addition, global call forwarding services lend themselves to centralization. Rather than maintaining several offices around the world, all incoming calls can be routed to a centralized call center which can also be located virtually anywhere. Sound quality - The traditional public switched telephone network has proven itself as a reliable system with exceptional sound quality. While Voice over Internet Protocol (VoIP) has emerged as a promising alternative, its sound quality is typically inferior to PSTN. Dropped calls, echoes, and line noise are but a few of the common sound issues with VoIP. Fortunately, both technologies allow for low cost calls, so you don't need to sacrifice sound quality for the sake of costs. Simultaneous call processing - This is an important feature if you want to ensure all incoming calls are handled appropriately. When two or more callers call at the same time, simultaneous call processing routes each call through the PBX system's hunt group. Local ring tones - With global call forwarding services, the ability to add a local ring tone unique to the country ensures that not only do callers see a familiar looking phone number, they hear the same ringing sounds that they're accustomed to hearing. Account management tools - The ability to manage your global call forwarding services is vital. For example, if you need to temporarily change your ring to number, simply log into your account and change it. This is a real-time change and there's no waiting for an external service provider to act on your behalf. In addition to being able to modify your account's settings, you can also review detailed call history reports and more. No fees for busy calls or incomplete calls - If callers dial your number and receive a busy signal or are disconnected before the call completes, this feature ensures that you are not charged for the call. Fax forwarding - You can also use global call forwarding services as an alternative to an international fax machine. With this feature, faxes are forwarded to your email address as an attached image. Voicemail options - When calls are routed to voicemail, you can optionally configure your global call forwarding services to forward those messages to an email address. Advanced routing options - When it comes to global phone calls, callers will be calling you at all hours of the day and night. Even if you operate a 24-hour call center, you may want to handle calls during local business hours and staff each shift with customer service agents that speak the correct languages. By using time of day routing, you can route callers to live agents during the callers' normal business hours. When callers call after business hours, you can set up time of day routing to send those calls to voicemail. Similarly, you can set up global call forwarding services to ring to specific agents based on Caller ID. Exceptional call quality, numerous calling features, month-to-month plans (with a rollover minutes option), and support for local and toll free numbers in dozens of countries are just a click away for Global Call Forwarding Services.